Welcome to Aislinn Nails & Spa! Aislinn Nails & Spa brings you a New Brand of salon, a uniquely vibrant and relaxed environment with a modern luxurious feel back to our industry. We have an exclusive vision to recognize and re-establish what the industry has been lacking for many years now. 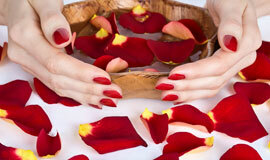 Our priority is to make our clients feel pampered and relaxed while enjoying their experience here at our salon. We will maintain our progressiveness and edginess by creating the latest trends and offering excellent service throughout your stay with us. You belong here, you belong in luxury, you deserve pampering and excellence. We make it our priority to provide a comforting yet professional ambiance, while preserving the luxurious and modern salon etiquette. Our salon is proud to have passionate and diverse expert technicians. Be at peace with Mother Nature and enjoy what she has to offer.